From powering up small devices like calculators, to supplying medical refrigeration for towns in developing countries, solar energy has found a wide variety of uses in everyday life. Most commonly, solar energy is known as the most abundant source of clean renewable energy on Earth. There's a total of 173,000 terawatts of solar energy that is continuously supplied to the planet from the sun! However to make solar energy usable, it must be harnessed and converted which is where these little wonder-disks called solar cells come in. But have you ever considered just how much goes in to producing each solar cell? Read on to find out. In making the solar cells, the main material needed is pure silicon. The silicon is purified by placing it into an electric furnace. The oxygen needs to be released, so a carbon arc is then applied, producing carbon dioxide and molten silicon. It is then further purified through the floating zone technique to make it usable for solar cell production. The impure silicon enters a heated zone multiple times in the same direction and directs the impurities to a single point with each pass until it has been removed of all impurities. Using the Czochralski method, a kernel of silicon crystal is submersed into melted polycrystalline silicon and upon withdrawal, produces a “boule,” which is a pure, cylindrical block of silicon. The silicon boule can now be used to make silicon wafers, which are cut using a special saw. 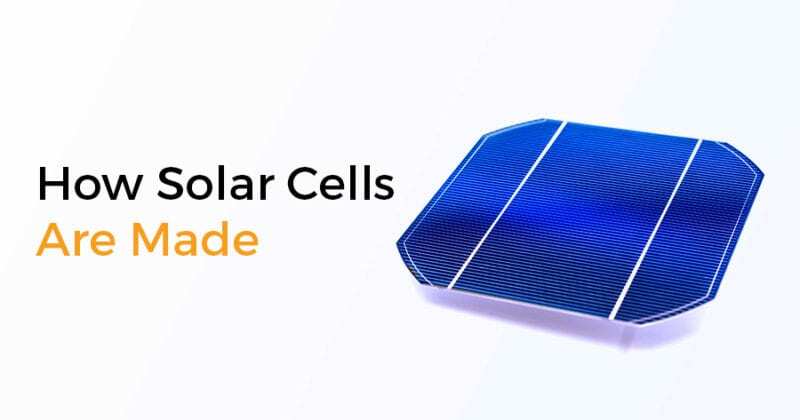 For solar cells, wafers are sometimes sliced in rectangular or hexagonal shapes as it will be easier to fit them together and maximise all the available space in the cell. The silicon wafers are then either polished to remove saw marks or are left unpolished by some manufacturers, as rougher cells can capture light more effectively. Next is the doping process which is the “contamination” of a semiconductor material with impurity and diffusing chemical elements, achieving either a positive charge surplus or a negative charge surplus. The silicon wafers are traditionally doped with boron and phosphorous during the Czochralski process. They are then fixed back to back and are heated in a furnace with phosphorous gas to a temperature slightly below silicon’s melting point. After doping, electrical contacts are then placed in each solar cell to connect them to each other and to the receiver of the current. The electrical contacts must be thin enough for the cell to still absorb sunlight. Once the contacts are intact, “fingers” (thin strips printed to metallised cells) are placed in between the cells. Then comes the coating of the solar cells with anti-reflective materials. As silicon has shine and can potentially reflect 35% of sunlight, coatings like titanium dioxide and silicon oxide are used on the silicon wafers. Another way of removing the reflective properties of silicon is using oxygen and nitrogen to produce silicon dioxide or silicon nitride. Once all of that happens, the solar cells can now be sealed into silicon rubber or ethylene vinyl acetate. They are then put into an aluminium frame and are ready for quality control. After such a complex production process, it's no wonder there's a vast difference in the quality of solar panels on the market today. Inferior production techniques and materials can greatly reduce the efficiency and performance of a solar cell. It's important to ensure you're choosing a reputable brand that won't engage in cheap production processes and is known to produce high quality solar panels. Infinite Energy offers premium, tier 1 solar panels from industry leading brands. More information on our solar panel product offering can be found here. If you’d like to receive a free, no obligation quote from one of our energy consultants, contact us today.